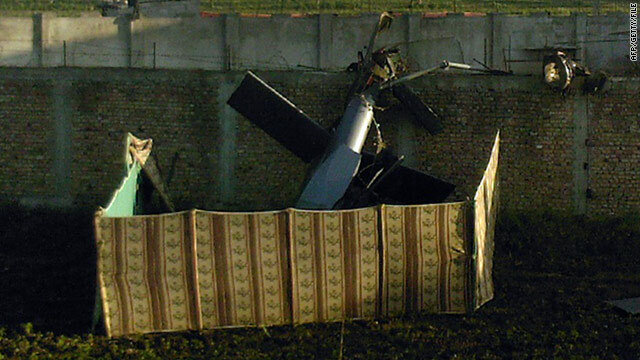 News reports suggest Pakistan may have allowed China to examine the U.S. helicopter downed during the bin Laden raid. Pakistani official: The claim is part of a "malicious campaign"
U.S. official: "We have strong suspicions"
Washington (CNN) -- The United States is concerned that Pakistan may have given China access to the high-tech helicopter that crashed in the U.S. raid on Osama bin Laden's compound, a U.S. official said. "We have reason to suspect China was given access but we cannot confirm it definitively," said a U.S. official who is not authorized to discuss intelligence matters publicly. "We have strong suspicions." The comment came Monday after news reports suggested Pakistani authorities may have allowed Chinese engineers to see the stealth aircraft. Pakistan's military has denied the allegation, saying there is "no truth to the report." In a written statement, Maj. Gen. Athar Abbas told CNN the claim is part of a "malicious campaign" against Pakistan's security forces. Abbas "expressed his astonishment at the far-fetched reporting of certain foreign media outlets," the statement said. The Chinese Ministry of Defense has denied the report "and denounced it as ungrounded and ridiculous," said Wang Baodong, a spokesman for the Chinese Embassy in Washington. He declined to comment further. The Financial Times newspaper in London reported that it had learned that Pakistan "allowed Chinese military engineers to photograph and take samples from the top-secret stealth helicopter." It added that "people close to the White House and the Central Intelligence Agency" told the paper that "the Chinese were in fact given access to the helicopter." China declined to comment, the article said. The New York Times reported that "Pakistan's intelligence service probably allowed Chinese military engineers to examine the wreckage," citing "American officials and others familiar with the classified intelligence assessments." It noted that the "American assessments were disclosed" by The Financial Times. China and Pakistan enjoy a long-standing military relationship, and the May raid that killed bin Laden -- staged without informing the Pakistani government -- stoked tensions between Washington and Islamabad. In July, the United States said it was withholding $800 million in aid to Pakistan. CNN's Barbara Starr, Reza Sayah, and Josh Levs contributed to this report.